Saturday July 22, 2017 at 8 a.m.
You can also register on-line at www.GetMeRegistered.com/BarkinthePark. 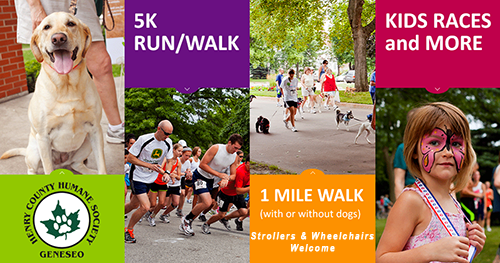 5K Run/Walk has no age limitations and starts at 8:00 A.M.
1 Mile Walk (with or without your dog) starts at 8:10 A.M. Kid Races (no age limitations) start at 8:45 A.M. There will be post race snacks, awards, kid’s games, the pet contest, and more. 1 Mile Walk (with or without your dog) fee is $20 ($25 after June 23). This option also includes one race T-shirt and packet. Plus, all participating walkers & dogs get a ribbon! Kid Races (no age restrictions) fee is $5, does not include a T-shirt. (Cost remains $5 even after June 23. Family Rate (must register 3 or more family members at the same time) fee is $30. The Family rate receives NO t-shirt, packet, kid’s games, or Dog Gifts. T-shirts may be purchased separately after the race – subject to availability for $10 for sizes S thru XL, XXL & XXXL are $13. Again, there is no implied guarantee of availability if not ordered before June 23. For more information explore this website, GeneseoBarkInThePark.com or contact Kalie at 309.507.0187. On your marks . . . Get ready . . . This entry was posted in 1-Mile Walk, 5K Run, Bark in the Park, Kid's Races, Pet Contest on 2017-02-10 by Mark.